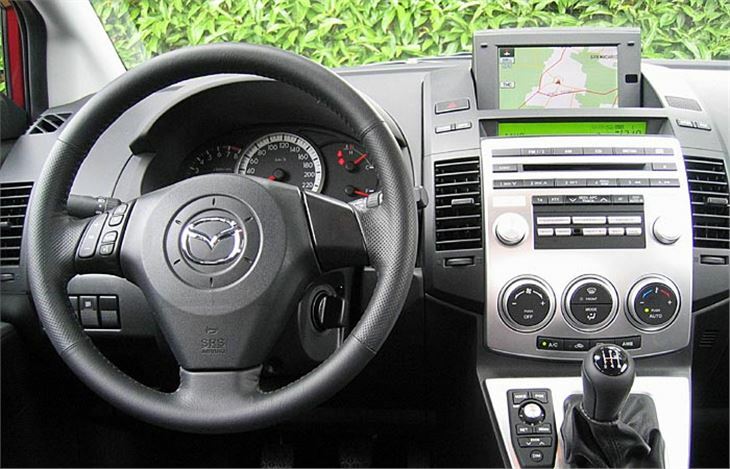 The Mazda 6 seats five. 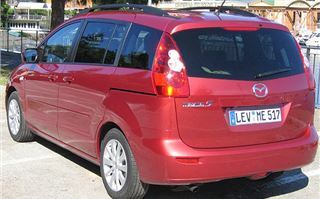 The Mazda 5 seats seven. Once you’ve got your head around that we can talk about what ‘project manager’ Kenichi Fukanaga calls a “6 + 1”. It’s built on basically the same platform as a five seater Mazda 3, which we all know is the same as a Volvo S40, Ford C-Max and the new Focus. A very good place to start. What Fukanaga and his team wanted to do was create a versatile and practical car, with functional features like sliding doors, that is also good to drive, and looks good. So, seating plan first. 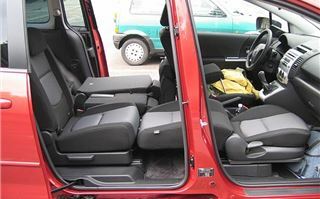 The 6 + 1 idea involves a gap between the two centre row seats into which either a narrow centre seat base can be swung from inside the left seat base, or a console tray with a suspended oddments bag from inside the right seat base. The Japanese call this idea, and indeed any idea that is unexpected yet well thought out, “karakuri”. 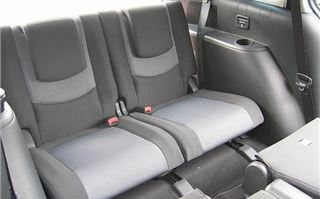 Behind these seats is another pair, really only of use for children who do not need booster seats or for very small adults, that can be easily accessed by a lever that slides each centre seat forward. 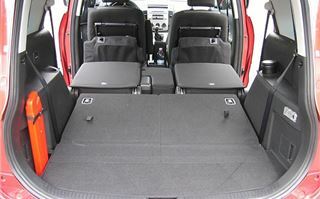 These rearmost seats can be individually collapsed at the pull of a tab to create more luggage space. But that’s not all. The centre row centre seatback can be folded down as an armrest or folded and twisted to poke things like surfboards or skis through. Both the front and centre row seats slide, so legroom can be fairly distributed for all three rows. 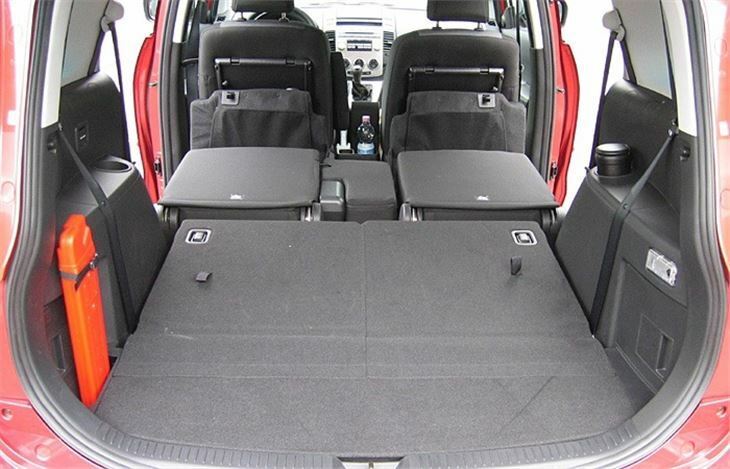 The front seatbacks can be folded right down to meet the rear seat squabs so they can become beds. The centre seatbacks also recline, making it more comfortable to sleep on a journey. And the centre row can be quickly re-convoluted to create a flat load floor, admittedly with a small hole in it. So Fukanaga’s team has genuinely made the interior as versatile as it possibly could be. So what is this paragon of versatility like to drive? Sadly, from launch in July (brought forward from September) we won’t see the two diesel versions. They don’t arrive until early 2006. And no mention was made of an automatic. 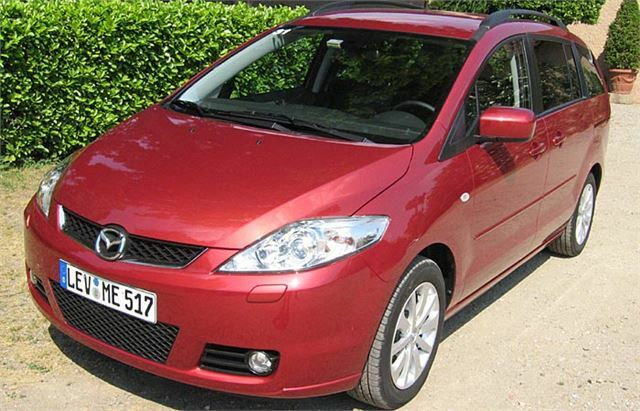 So effectively we only get the chain-cam 1.8 and 2.0 litre petrol engines, as found under the bonnets of Mondeos and Mazda 3s. The 2.0 litre 5-speed we drove was also quite low geared, giving around 21mph per 1,000 rpm, though this makes sense considering the loads it may sometimes be asked to haul along. Fortunately it’s a smooth engine, so the revs aren’t wearing at motorway speeds. 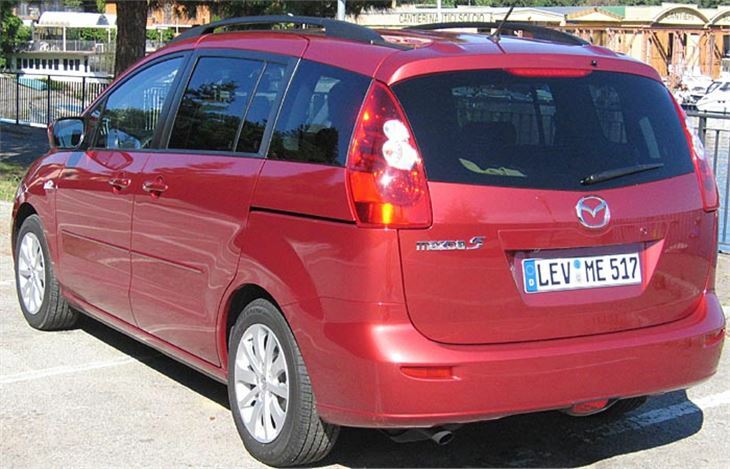 The Mazda 5 steers and handles very well indeed. 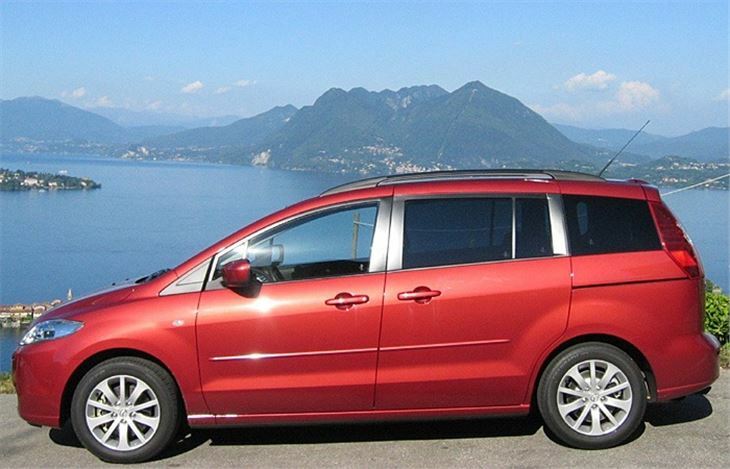 More like a car than any other MPV I can think of, including the excellent C-Max, Corolla Verso and Peugeot 307 SW. 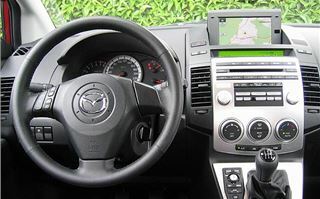 Steering feedback is as good as a Mazda 6 and much better than 2.0 litre Mazda 3s. As a driver, you simply aren’t conscious of the any difference in centre of gravity. And we did drive it on some extremely tortuous mountain roads. Despite hairpin bend relentlessly following hairpin bend it didn’t put a wheel wrong. Any breakaway you eventually experience will be at the front and even that is kept in check by the various electronic systems. Additional thoughtful touches include oversize door mirrors giving a good view along the sides (very important for spotting small children on the school run). If you opt for the excellent but expensive DVD satnav, you get a colour rear camera that automatically displays the view behind with an outline of the vehicle on the satnav screen whenever you select reverse. The split cubby behind the parking brake has a tray perfect for any size of mobile phone, including the fat new PDA size ones. There are bottle holders all over the place (at least eight). A rubberised dash shelf is useful for phones or pens. 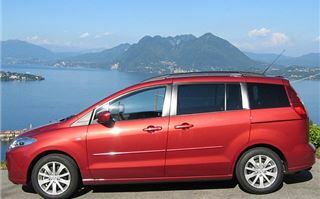 Rather than think of the Mazda 5 as an MPV that drives like a good car, it’s probably better to think of it as a good car with the versatility of a very good MPV. If you like driving and you have a family but only want one car, then it does both jobs better than anything else.